We are trying to get back in the groove at the House of Hills after a week on vacation and before that a week when My Sweetie’s back was out and the week before that we had just moved in and the week before that we were moving and the week before that we were packing. Ya, it’s been a little insane here at the House of Hills. However, it appears that our calendar is calming down so that’s good. Are you having anything yummy this week? 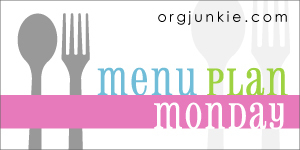 Check out orgjunkie.com for Menu Plan Monday and lots of great menu ideas! This entry was posted in Menu Plan Monday by KHill. Bookmark the permalink. The garlic shrimp sounds fab! I will have to give it a whirl soon. Stop by and see me sometime over at Free 2 Be Frugal.